We had the privilege to visit the location where John Leland, the representative leader of the Baptists in Virginia, spoke, introduced and gave his full endorsement to James Madison. Madison went on to speak detailing his plan to incorporate in the new U.S. Constitution an amendment for Religious Freedom. This is a quiet place by the side of the road today and as you can see there is a mighty oak tree that stands as a witness to the spot where those men stood over 200 years ago. The site is along Route 20, just a few miles east of Orange, VA. 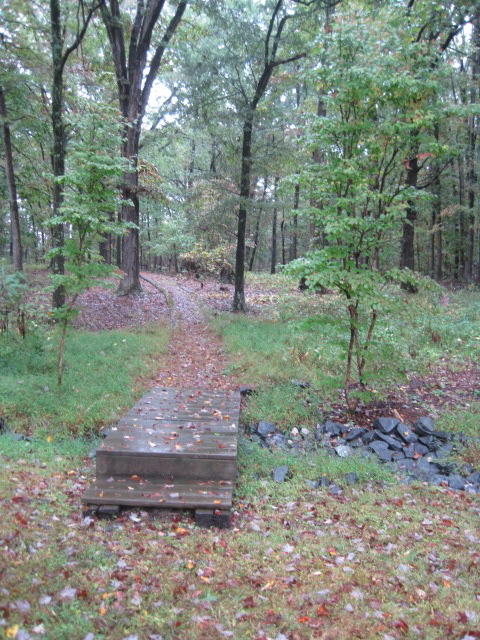 The little bridge to the path . . . The huge oak stands tall . . .
A bench to sit on and give thanks for those who stood mightily . . . Praise ye Jehovah, for heroes before us!